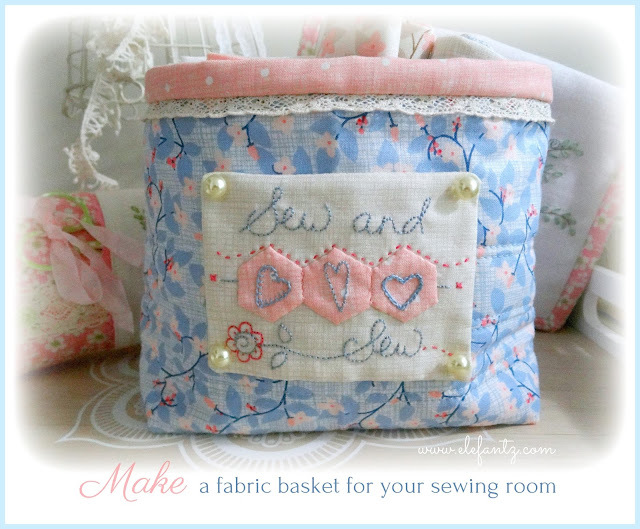 I believe when you have a pretty sewing room, or sewing area in your home, inspiration comes far more easily to create. Lately I've spent quite a bit of time in my sewing room making gifts, Stitchery Club projects and useful items for around our home, but as I've pulled out this fabric and that fabric to choose the right one (or two or three) for each project, my fabric shelves have lost that lovely order I crave and try to maintain. Years ago I made some small fabric baskets for storing fat quarters in their various colour combinations but we've moved house five times since then and those little baskets were passed along to family or friends along the way and I never made any more. However, I remember just how useful (and pretty) they were, and a few of them would certainly come in handy on my fabric shelves as well as adding a little shabby chic style eye candy for good measure. They're the perfect size for my baskets and have all been sewn using the same threads and fabric range so my baskets will co-ordinate beautifully. I made one basket this afternoon while the wind howled and the rain fell and even though the lighting in my sewing room wasn't the best I still managed to take enough photos to share a tutorial with you in case you find yourself 'needing' some fabric organisation in your sewing room too. Honest, these baskets are simple. 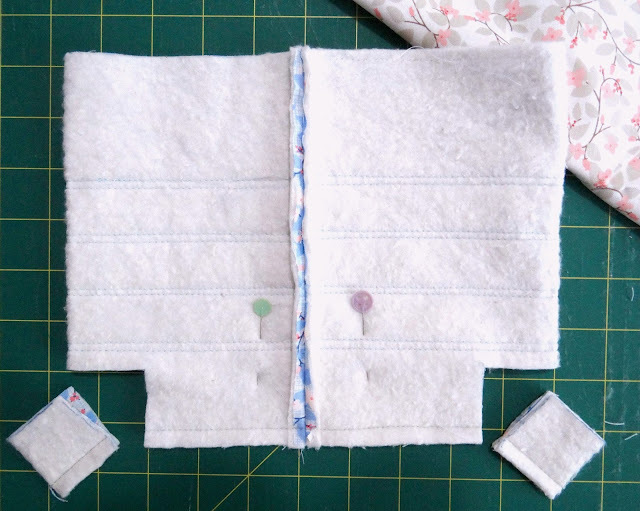 If you're savvy with quilting tweaks you can make them any size you like just by altering the size of the outer fabric and lining dimensions. Mine hold about 12 fat quarters. So, to begin you'll need two different pieces of fabric measuring 7 1/2" x 19". One is for the outside of the basket and one is for the lining. 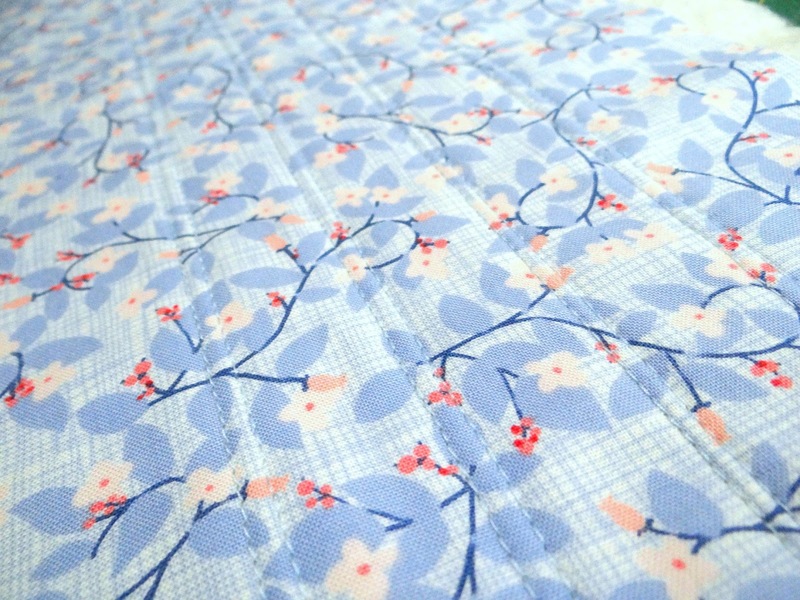 You'll also need some wadding or Pellon a little larger than your fabric, a length of lace (about 20" long), and one length of fabric 2 1/2" wide to make into quilt binding. 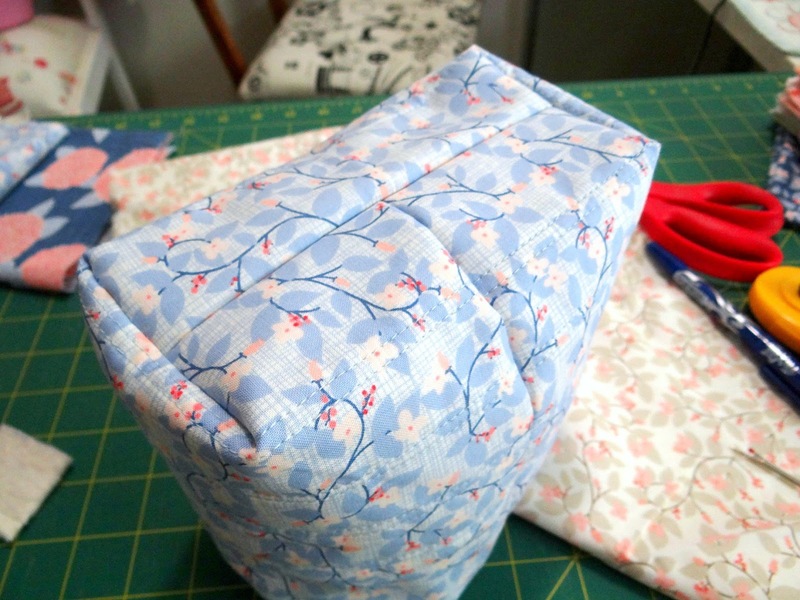 I have plenty of quilt wadding off cuts in my scrap box and love finding a use for them! 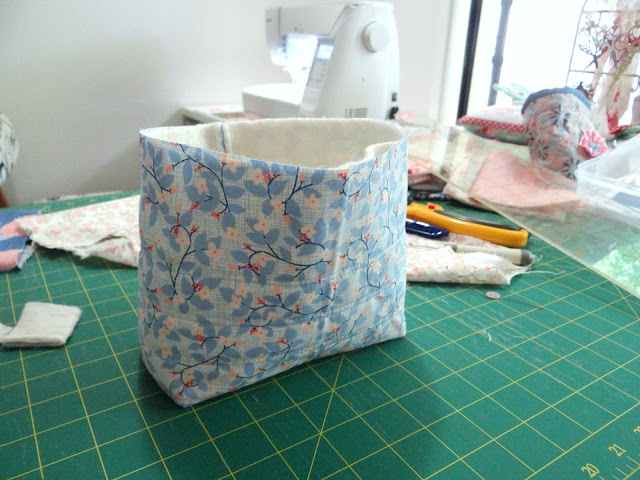 This project is perfect for any pieces 8" x 20" or larger. 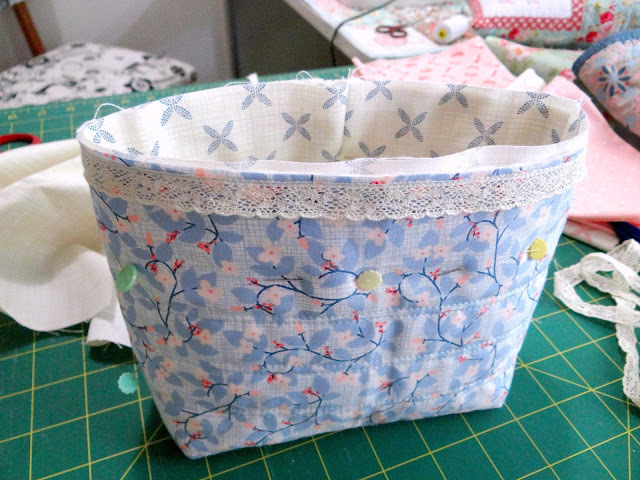 The floral fabric is for the outside of the basket and the cross fabric will be the lining. After quilting trim away the excess wadding. Fold the quilted outer fabric in half and sew a 1/4" seam along the narrow end. Press the seam open and sew a 1/4" seam along the bottom. 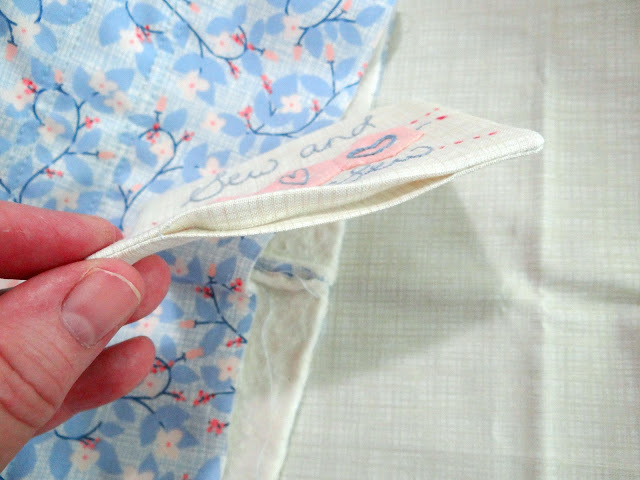 Spread the openings flat and sew along them with a 1/4" seam to close the hole. This creates a boxed bottom. Now turn the basket right side out. At this stage I also made a little stitchery mini quilt which I'd fasten on the front later. 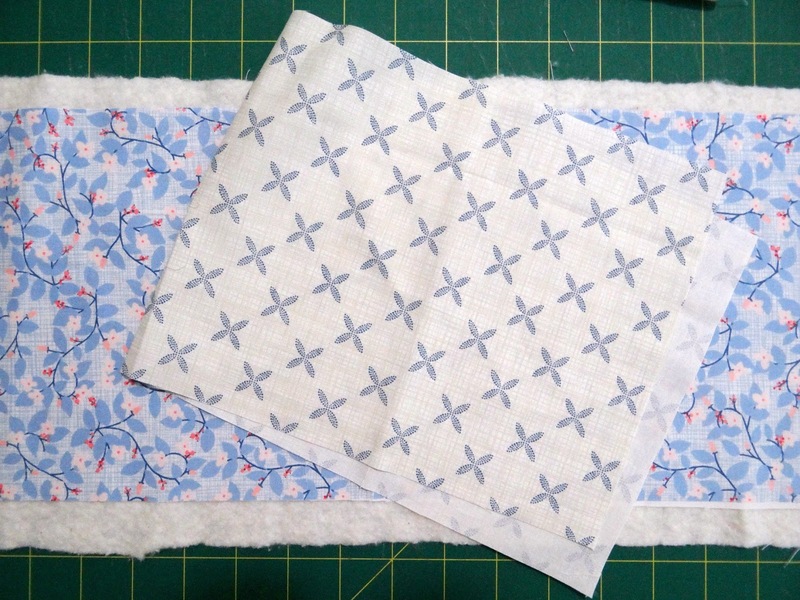 When I make this kind of stitchery display I measure 1/2" away from the edges of the design and trim it. This gives me 1/4" seam all around and a 1/4" distance between the stitchery and the seam. 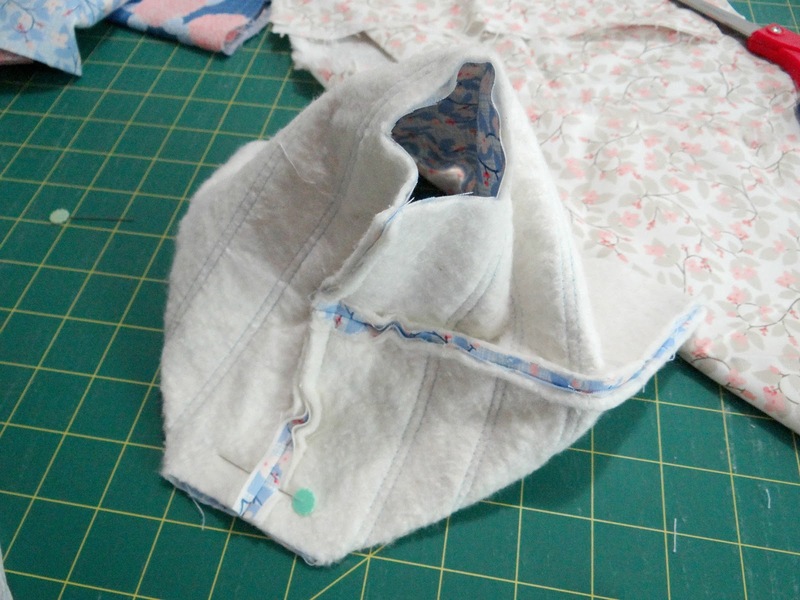 The I lay it face down on another piece of fabric, sew around with a 1/4" seam leaving a 2" opening along one side for turning out. Ladder stitch the opening closed and I have my cute mini quilt ready for display. Sew a length of lace around the top edge of the basket. My lace was narrow so I dropped it about 1/8" under the top edge as I wanted as much lace as possible to show through when the basket was finished. Make the lining of your basket the same as you made the outer basket but without any wadding. Place the lining inside the basket, wrong sides facing each other, and pin the lining and the outer basket together through all layers. Sew around the very top of the basket with a scant 1/8 inch seam to secure the outer basket and the lining together before adding the binding. 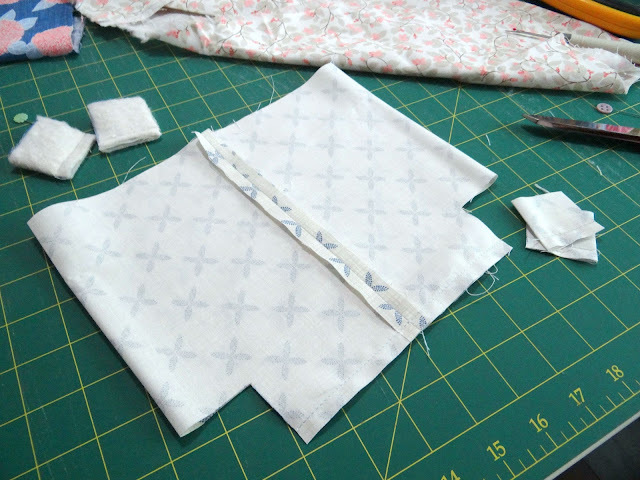 I cut a piece of fabric 2 1/2" wide x 21" from a fat quarter for the binding and attached it the same way you'd fix binding to a quilt. 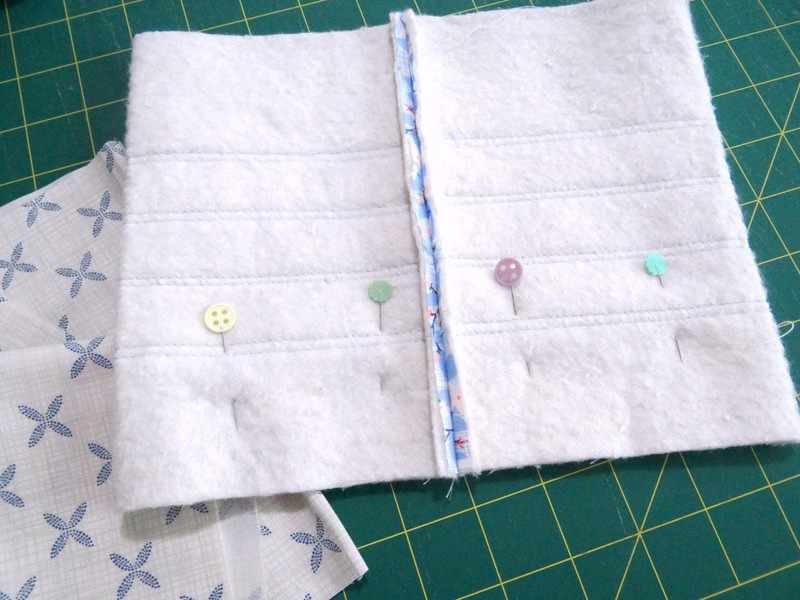 The final step was to sew my little mini quilt stitchery to the front with gorgeous pearl buttons. 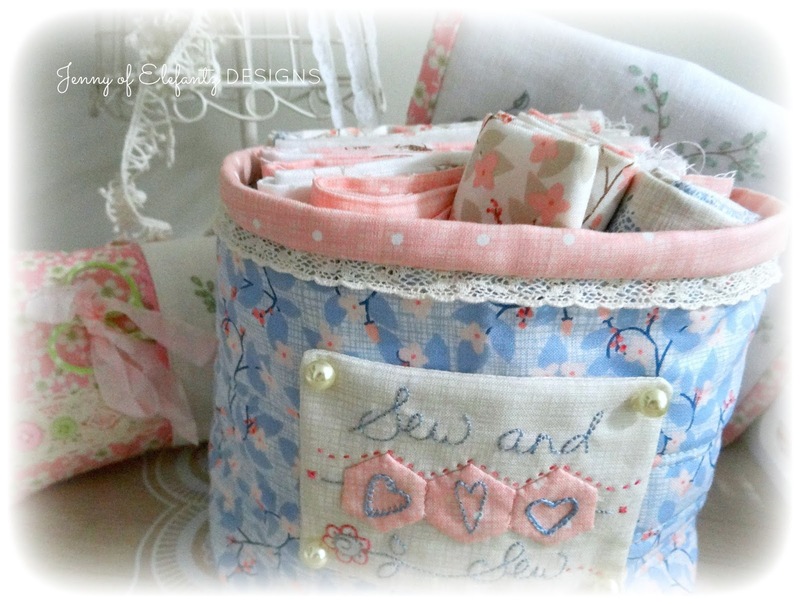 Filled with fat quarters from the same fabric range used to make the basket it looks beautiful! 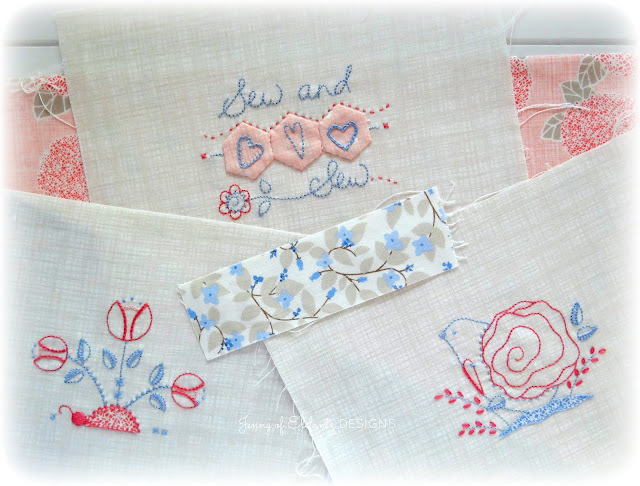 Now to make another few, then the fabric shelves in my sewing room will be ordered, tidy and looking beautiful again. Will you make some too? Feature any stitchery you like for the front decoration or if you want to use the Sew & Sew one that's featured on mine you'll find the pattern here in my shop. My basket was made using "Bayberry" fabrics by Kate & Birdie Paper Co of Moda. I hope your Easter was special. Our Resurrection Sunday was very special indeed, full of Cully May hugs and baby Rafaella cuddles, good food, laughter, conversation and memories made to treasure forever. It was also life changing. 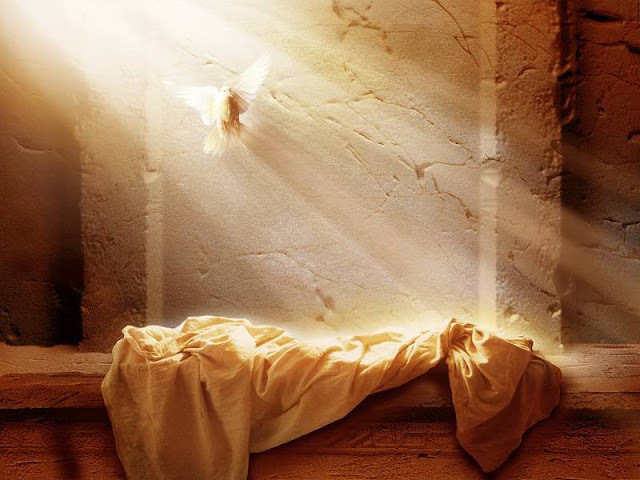 Every year as I read, reflect and pray over the gift that Jesus gave us through His death and resurrection my heart grows with love for Him and the Lord expands my understanding of His sacrifice. and I wanted to let you know that my OMG this month is to hand quilt my Shabby Roses quilt--did get the top done a few years ago--and last year got the back and batting done and got it basted for the hand quilting--so I picked it finish this month--so I will be thinking of you every day this month for sure!!! Thank you for the easy-to-understand tutorial to make that darling basket! Yours is so cute. I'm so glad you had such a wonderful Easter with you family...little ones always make it more special. What a beautiful basket. 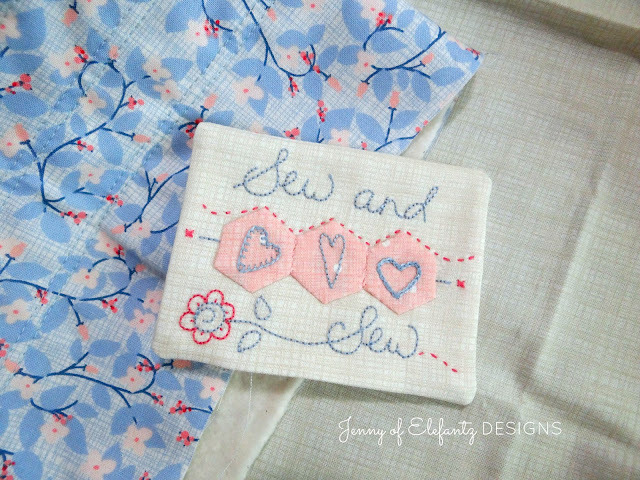 It brings back a whole lot of memories for me Jenny with the stitchery you chose for it. When Jim and I were first married, almost 38 years ago, he got a new job in St Louis 3 months later. We decided that I would be a stay at home wife. 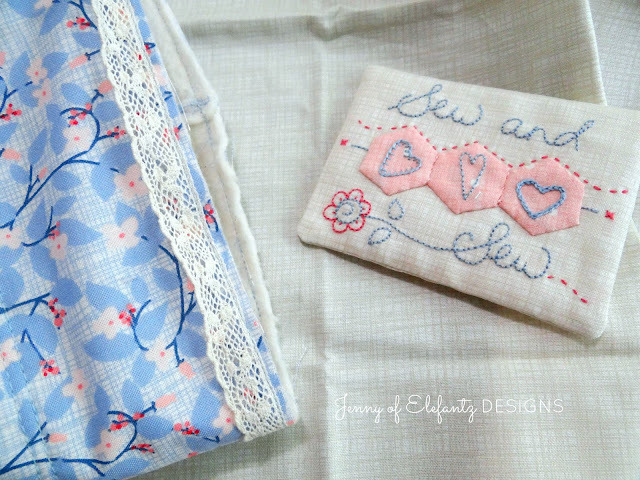 To earn some much needed extra income I had a small altering and and seamstress business called Sew and Sew. We had business cards printed up and took out ads in the paper. I received quite a bit of work and the extra cash certainly helped. I want to make up a basket just to have the reminder of the early days of our marriage. Easter is my favorite holiday. It has not become too exploited, or I am just closing my eyes to it. Just waking up Easter morning and thinking, He Is Risen! The mystery leaves me in awe. Have a wonderful day Jenny! 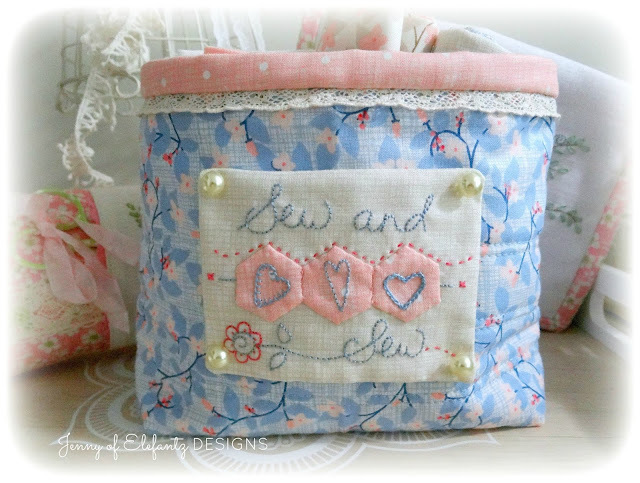 Hello Jenny; I have been wanting to make some fabric baskets for storing some of my fabric scraps into colored categories. Your excellent and beautiful basket tutorial will be what I will take some time today and make. Thank you so much for sharing. I am glad that you and your loved ones had such a memorable Easter. Have a fantastic day! My Easter was calm and quiet, and I'm glad to know yours was fruitful and family filled. The understanding will probably never be complete, but we keep building it! Jenny I am off to make some of these baskets right now. I have been looking at various material/quited baskets, to make into a change table basket for the Granddaughter due early May. I have what I want to place in it made, just needed to inspiration to get one made. Thank you as you have given me that inspiration. I have a few of the March stitcheries made up and I think these might be just perfect on a basket for the new baby. Hope that the weather doesnt get too rough. Right down here in Hervey Bay it is windy with passing showers. Sure hope that you miss out on any flooding. Thank you for the basket tutorial. It's such a lovely soft colour palette that you've used too. Hi Jenny Thankyou for your tutorial, beautiful basket, I will need to make one or two. Such a lovely idea. A pretty basket would certainly look much better than my plastic drawers and containers. I have a white wooden CD rack for my fat 1/4s . Thankyou for sharing your tutorial. Sounds like you had a lovely precious time with family. Thanks for the tutorial. It is one of those maximum effect for minimum effort projects that I like. Your fabric choice works beautifully. I’m glad you had such a wonderful day on Sunday. What a beautiful and useful project - love it, thank you sweetie!!! Beautiful baskets. I can sure use more. Than a few! Thank you for the tutorial very easy to understand! So beautiful basket.Thanks for the tutorial! !